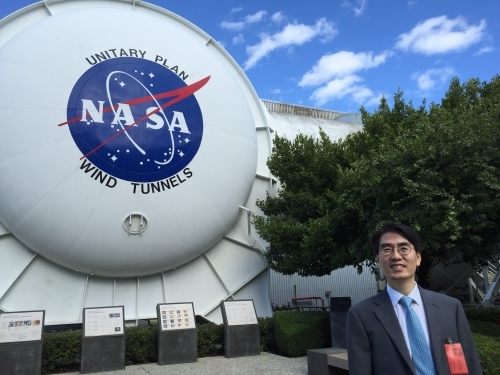 Prof. Myung delivered a lecture at NASA Ames Research Center, San Jose on June 15, 2016. "Recent Advances in Urban Robotics"
Ubiquitous City (U-City) is an emerging concept for urban environments of the future, in which new living and working services result from interlinking the physical and electronic (digital) realms. In this talk, the core technologies and their implementations to provide various services in the ubiquitous city (U-City) will be presented, with a focus on localization, autonomous navigation, and monitoring technologies. 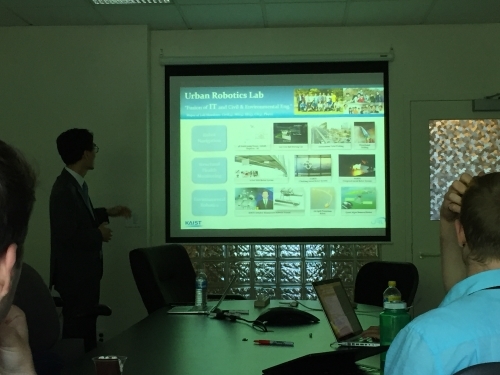 For robot navigation, research into wireless and vision-based simultaneous localization and mapping (SLAM) and underground localization will be discussed. For Structural Health Monitoring (SHM), vision-based SHM and a wall-climbing drone for SHM will be introduced. For environmental robotics, JEROS (Jellyfish removal robot), an oil spill protection robot, and a green algae removal robot will be shown.